This month our featured 'Real Wedding' is Tina and John who got married at the Hilton Hotel Liverpool in late December. Tina had a dark purple colour scheme for her Christmas Wedding Flowers and wanted traditional roses but not too formal. So we added ivy, berries, eucalyptus and dark purple blooms to create a wild looking hand tied bouquet with a festive feel. The bridesmaids had similar smaller wild bouquets, which looked beautiful against their dark purple dresses. 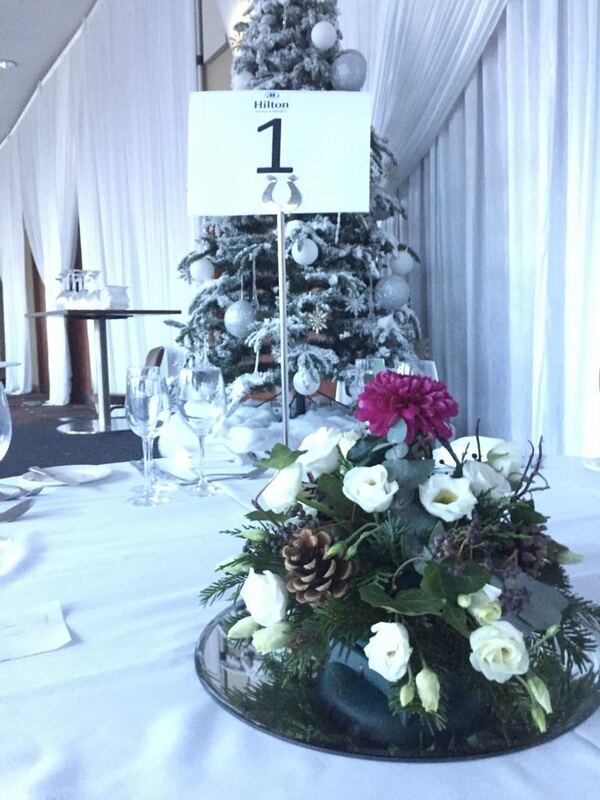 We also decorated the venue with table arrangements on each table which had the same purple and white wedding flowers but we added pine cones to complete the festive look. A long and low arrangement for the Registrar's table, which was then moved over onto the Top Table was also made in the same flowers. Christmas Trees and decorations at the Hotel completed the look of this Christmas Wedding. 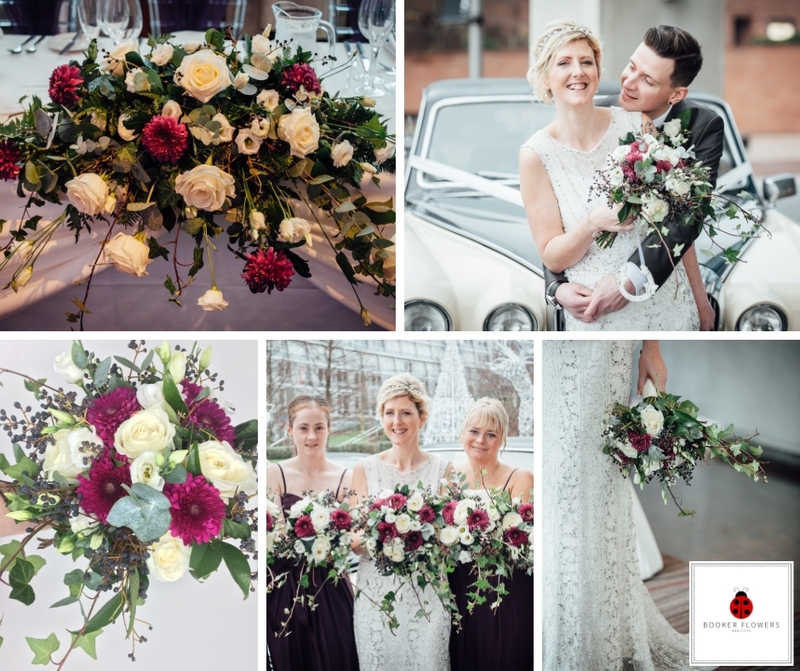 To see more photos of Tina and John's beautiful December Wedding Flowers, including professional photos from the very talented Liverpool Photographer Antonio Franco, check out our Wedding Flowers Gallery. 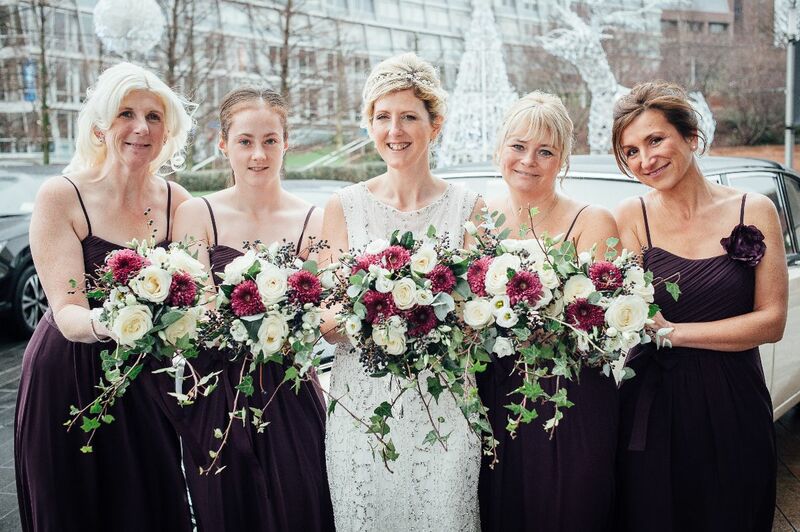 All the pictures on our website are from real Weddings, so if you want some further inspiration or would like to read our Bride's testimonials (like Tina's below) then check out our Liverpool Wedding Florists website.